We have a very nice selection of pups ready for their new homes. We are available all weekend to show them, don't worry about calling us on a "holiday". When you have a bunch of pups to take care of, you don't really get a day off. Hope to hear from you soon! The Christmas holidays have come and gone and we wish to thank everyone who gave a new home to our pups. We still have a good selection and have decided to reduce the prices on several of the breeds. Check the links for more information on each breed and price reductions. If you have any questions or would like to schedule an appointment, just give us a call. We keep ourselves available the last days before Christmas just in case you decide you want to come see a pup. So don't hesitate to call us either day. We would welcome the opportunity to find a new home for one of the many pups still available. Still plenty of pups and plenty of time for you to make your decision for a Christmas pup. I try to keep the site updated daily, so that it is current as to availability. Just give us a call with any questions or to schedule a time to come and see them. 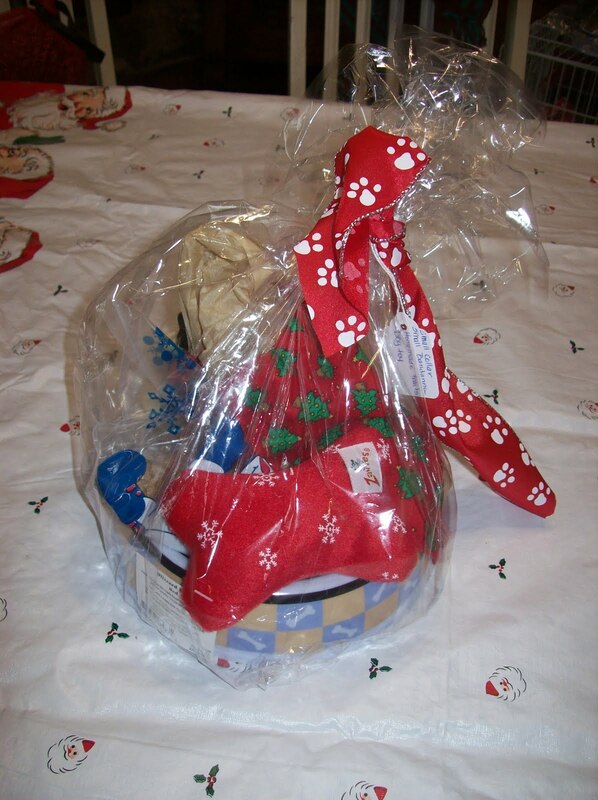 If you are coming to see a pup and need a great gift for another dog in your lives, we have very nice "gift baskets" available, very reasonably priced. I make them up with handmade bandannas, homemade treats, etc. They are all housed in a dog bowl. I will post pics later today. Please keep this in mind. The countdown has begun and, boy oh boy do we have the pups for you to take a look at and give a new forever home to. I thought the pups would not be ready to be seen until this Friday, but it turns out that I am ready a couple days ahead of schedule. (who would have thunk it?) Anyway, if you are reading this and already have an appointment, no need to panic, if you would like to call and schedule for an earlier time, that would be fine, otherwise, if I promised you get first or second choice on a particular breed, you still will. I will not make other appointments for those particular breeds until whoever is on the list gets to see them first. But there are a bunch of pups that I do not have anyone waiting on, so if you would like to come and see them, give me a call. The only pups that absolutely cannot go home till Christmas Eve are the Teddy Bears. It is against the law to let a pup go to their new home until they are 8 weeks old. We can take a deposit on the Teddy Bears, but they won't be 8 weeks old until 12-24. Don't forget, I am willing to hold your pup with a 50% deposit and an additional $25.00 fee until Christmas. You can pick the pup up anytime Christmas Eve or until 9:30 am on Christmas. I always forget to mention that I have very nice crates for sale. A lot of people stop on their way to my house to purchase one and then tell me they wish they knew that I sell them. This holiday season I have crate packages that come with a handmade fleece bed, bowls, toy and treats. It saves you a little money if you were to purchase them seperately. It is a beautiful day, it is supposed to be beautiful tomorrow, I have all of the pups outside playing today. They are all in the 10 week age range, so I have decided to start discounting them in order for them to find homes sooner rather than later. Please check the links to see what the new prices are on each breed. Thanks to Brian and his sister Kendra, the last Yorky pup went to his new home today. 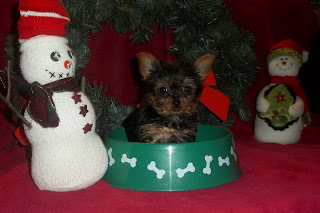 If you are interested in a Yorky, check out the link and it will tell you what is upcoming. 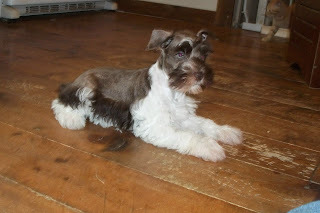 We still have all 5 of the Schnauzer pups available, so I have decided to reduce their price down to $425.00. 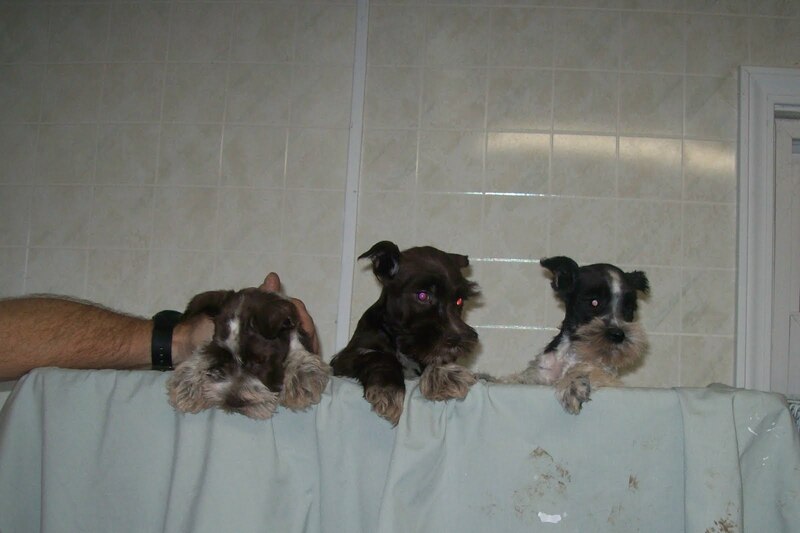 This is a great price for a quality schnauzer, give us a call to come and see any of the pups available. I don't have a link for the Beagle pups that are available, but you can see a picture if you drop down to an earlier post. Mr. Webb has decided to lower the price to $225.oo. These pups have good hunting genes in their line. They also make great family pets and are very tolerant of children. Give us a call to come and see them. Also have the pups that are on the links to the right still available. They are all waiting for their new forever homes. 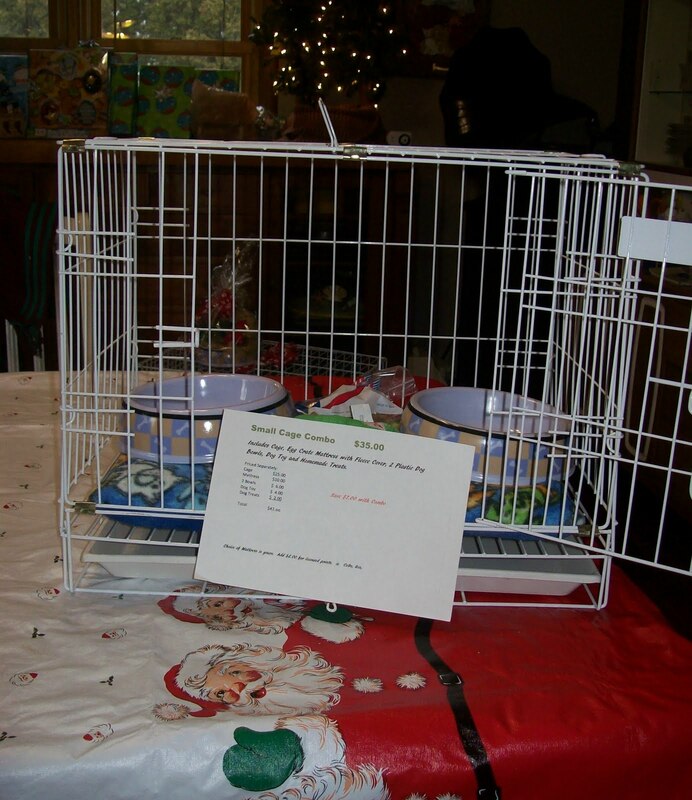 Both of the Cavapoos found their new forever homes today along with one of the Shih Tzus. Still have plenty of pups for you to look at, so give us a call. Mr. Webb, my sisters next door neighbor had a litter of 3 beagles. They are adoreable, lemon color, loving and playful. I am selling them for him. He has 3 female beagles and one male beagle and he saves the money he makes on the pups for his grandchildrens college fund. There are 2 females and one male available. They are registered with CKC, vet checked and have their first shots. $275.00 each. All the new babies will be ready to see and to go home on Sunday. They are beautiful! Check the links to the right to see a few new pics. Here is my favorite pic at the moment. I will try to get better action shots taken in the next few days of all of the new pups. Lots of pups have found their new homes. Still available are 2 Poms, 2 Teddy Bears, 1 Morky and 1 Schnauzer. These pups can be seen anytime and are ready for their new homes now. Starting Sunday, October 2, several new litters of pups will be available and I have already made a couple of appointments to see the new pups. 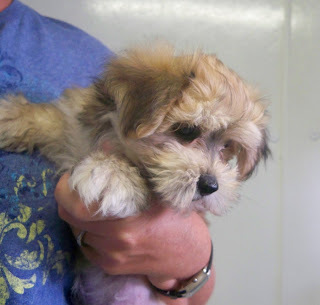 We will have: Schnauzers, Yorkies, Morkies, Cavapoos, Chiweenies, Chihuahuas, Shih Tzus and Teddy Bears. I will do my best to get new pics posted on Friday, so stay tuned! Let me know if you would like to schedule for Sunday or sometime next week. 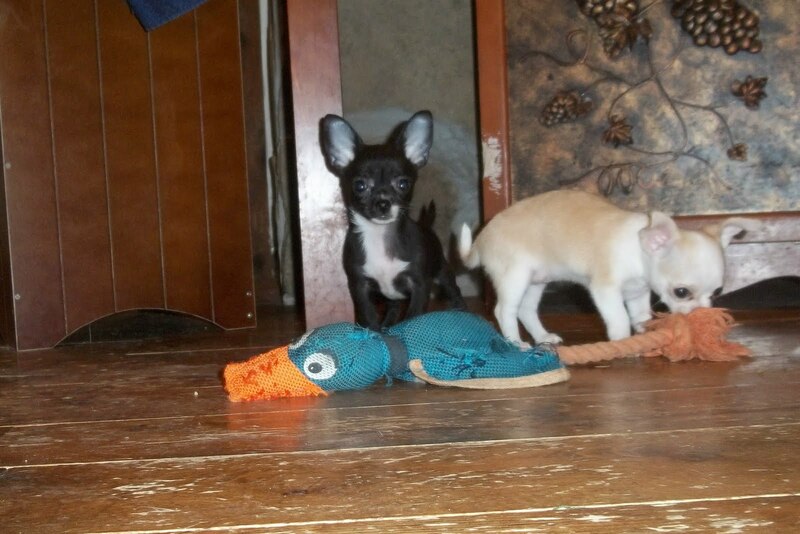 All 3 of the chihuahuas have found great new homes. Two of the sisters went to a new home together and the other went to a home with a big sister chihuahua waiting for her. 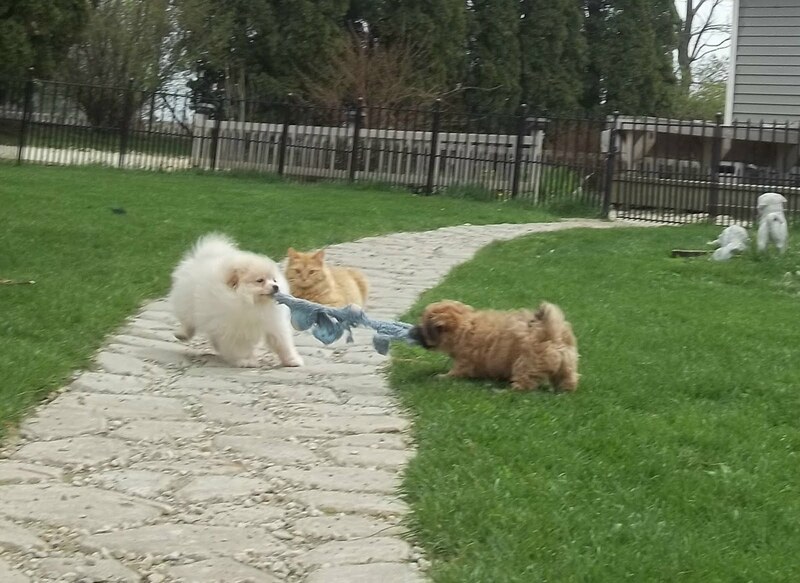 I love when they have a playmate. Still have beautiful pups here for you to choose from. Give us a call if you would like to come and see them. 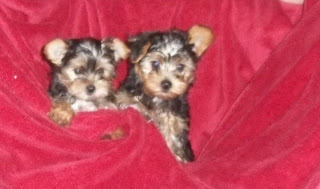 Have decided to lower the price on the 2 Yorkipoos that are still available. Their date of birth is June 13, so they are still young pups. Just about 12 weeks old. They are as sweet as can be. Two brothers, playful and loving. Reduced to $300 each. Give us a call. Ok, so I went to a tree auction today and got 5 ginormous pine trees to be planted behind the dog runs. That should keep the snow from coming into the doggie doors like last year. Just one little item to check off the list. Here is a little video of our granddaughter "training" one of the doxie pups that is available. Very, very cute. Oh yea, the puppy too. Labels: Here is a short video of our granddaughter playing with one of the doxies. So, the new puppies are actually ready to be seen today. I thought I would not be available to show today, but my plans changed. Give us a call to schedule an appointment to come and visit. Just finished updating the links with the pics of most of the new pups that will be available either next week or the end of the month. Still have a couple more pics to finish. 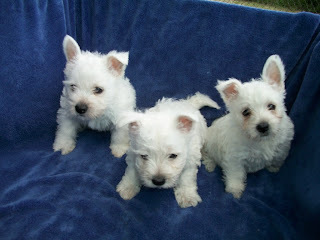 This is a picture of the Westies! 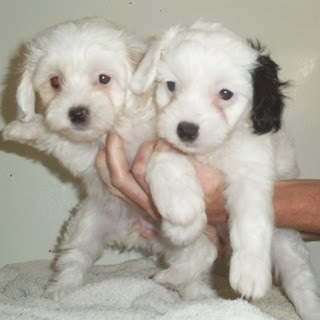 The Maltipoo and Female Cavachon found their new homes today with Kathy and Steve. Happy Anniversary to the two of them, hope they have lots of years of happiness with these two little ones ahead of them. So, I got a call today that said they were confused as to what is available, so I will try to clarify this. 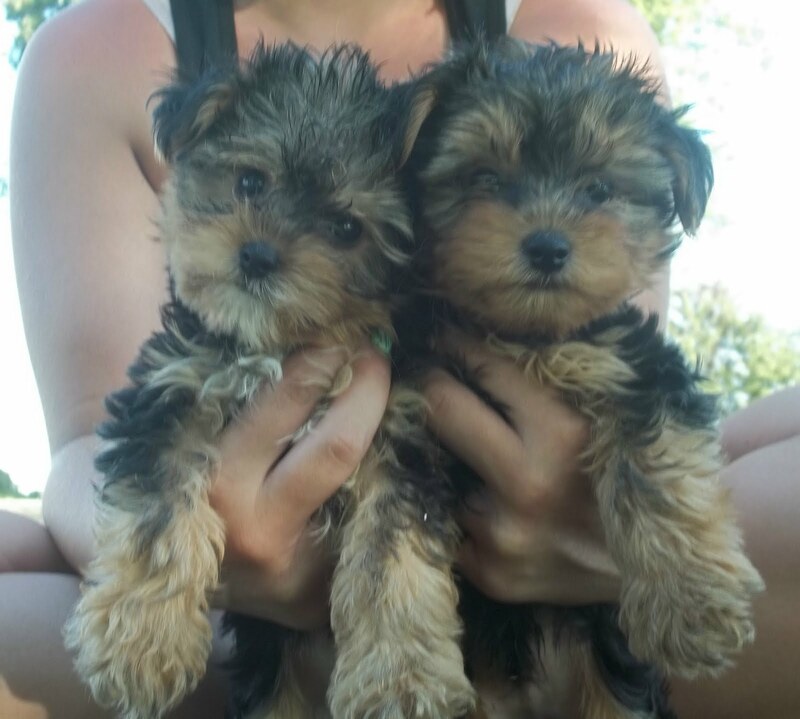 Ready to go right this very minute are 2 male Yorkipoos $400 each, 1 male Cavachon $500 and 1 male Shih Poo $450. Anytime Wednesday, Sept. 14, the following will be ready. Litter of 5 Teddy Bears, Litter of 3 Westies, Litter of 3 Poms (little girls already spoken for), Litter of 2 Morkies and 1 Female Mini Schnauzer. Around October 1, it could be the 2nd, we will have a bunch. 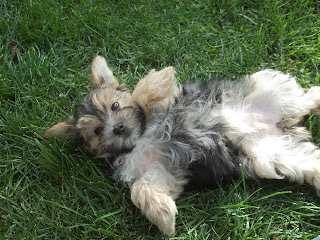 Yorkies, Morkies, Teddy Bears, Schnauzers, Schnoodles, Cavapoos, Shih Tzu and Chiweenies. If you have any questions at all or want to be put on the waiting list, just give us a call. Still have the 6 pups left that I talked about a few days ago. I thought that I would not have new puppies until October 1 ready for their new homes, but my cousin who I do not see very often happens to have a couple of litters available and I will have them here at my kennel to show and sell. 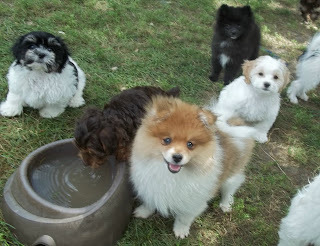 There is a litter of 3 male Westies, a litter of 5 Teddy Bears and 1 Schnauzer Female and 3 Poms. I already have a waiting list on my poms, so not sure if any of those will still be available. They will be here and ready for their new homes on Wednesday, September 14. Let me know if you would like to make an appointment to view these pups. Holy Catfish!!! What a crazy morning. 5 pups just went to their new wonderful forever homes. Thanks to the 3 families that came to visit us. I feel great about the pups new lives with you. We have just 6 pups left at this time. All of the above will make wonderful family pets. All of them are non-shed and are cute as can be. We are available most of the time to show, so just give us a call and come and visit. A couple of our pups went to their new homes today. If the last pup from our litters have left, I have posted on that particular breeds link when we will be having another litter available. I have also asked that if you are interested you get on the waiting list. Being on the waiting list does not obligate you to take a pup, it just gives you first chance at seeing the pups before the new ad hits the newspaper. I keep a running list of people who are interested in a particular breed and then make calls a few days prior to them being available to start scheduling appts. So, if there is a breed you are interested in that we no longer have pups available for, or if you are looking for a pup in the future and it is a breed that we have, give us a call and get on the list and I will be happy to contact you when the new pups are ready. The next group of pups will be ready on October 1. Wow, Labor Day is here already. It seems like we just celebrated July 4th. We are available all weekend to show these darling little pups, so do not hesitate to give us a call. Still plenty of good weather left to get your little one potty trained. Thank you to everyone who stopped by and decided to give one of our puppies a great new home. We are thankful everytime we meet a family that we know will love our pups for the rest of their lives. We still have a very nice selection of pups available, so don't hesitate to give us a call. Snapped a couple of real cute pics today. 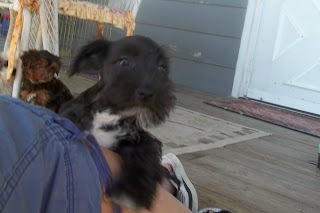 That black male mini schnauzer we have is sooooo handsome. I gave him his first schnauzer cut over the weekend. I also got a very good shot of a male Teddy Bear. Come and visit, we have plenty of pups to choose from! We celebrated my grandson Luke's 1st birthday today. Happy Birthday Baby Luke!!!! He spoke his first word a few months ago, I bet you will never guess what it was............It was DOG! Go figure. Anyway, back to the kennel news. The last rat terrier found his new home today and the sable and white pomeranian found his new home yesterday. Quite a few of the other pups found their new homes this past week, but we still have plenty to choose from. Check out the links to the right for each breed to see what we have. I will do my best to get pics of the pups that are available but still haven't gotten snapshots yet this week. Was playing with some of the pups today and was able to snap a couple of new shots. I am posting on each link as I take them. I stuck my camera down into the outdoor pen they play in and this is what I came up with. So glad the weather is cooperating for these little pups. That way, they can spend a good deal of the day outside playing with each other. My outside cat is usually in there with them too! Wow, the new pups have been a hit. I have only been showing them for a day and a half and already 5 have found their new forever homes. Makes me so happy for the pups and their new owners. So, if you are considering a pup that is listed on the website, don't wait too long to schedule an appointment, we are getting lots and lots of calls. I still have 4 pups available from the previous group. 2 Pomeranians, 1 Shih Poo and 1 Maltipoo. I have lowered the price on these 4 just to encourage one of you to welcome them into your home. Check the links for specifics. August 13, New Pups Available in just a couple of days! Any of the pups that are currently available can be seen all weekend, Monday or Tuesday evening. I am scheduling appointments for the pups listed below for anytime Wednesday or after. 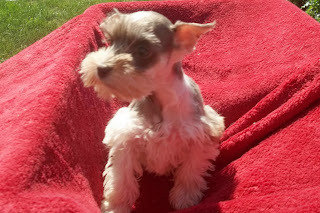 The new litters are as follows: Teddy Bears, Shih Poos, 1 Schnauzer, Morkies, Yorkipoos, Cavapoos and 1 Rat Terrier. There are pictures on the links. Check them out. They are adoreable! What Puppy Isn't! Still need to make room for the new pups that will be ready next week. 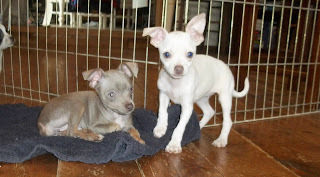 Therefore, I have lowered the prices of the little tiny chihuahuas to $300. These are quite small and absolutely adoreable. There are 2 black females, one has a little white blaze on her head. The other is a fawn and cream. Beautiful soft coats. Registered with CKC. 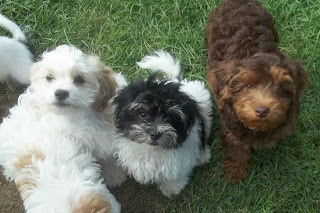 New litters that will be available after Tuesday, August 16 are: Teddy Bears, Shih Poos, Cavachons, Morkies and Yorkipoos. I will get pictures posted sometime this weekend. If you are interested in making an appointment to see these pups, give me a call. Last Dachshund found her new home today. Hooray for her. Still plenty of pups for you to choose from. Give us a call! The long weekend is coming up and I need to start getting ready for the new pups that will be available the following weekend. Sooooooo, I have decided that I need to discount more pups in order to make room for the new babies. JUST REDUCED - the schnoodles were priced at $400, I will accept $300. The chihuhuas are priced at $300 - I will accept $250. This is a crazy price for this quality of registered chihuahua. They are going to be about 4# when full grown. All 3 are girls and they are unusually colored and marked. The dachshunds were already reduced last week and I am staying at the $425 for these pups. 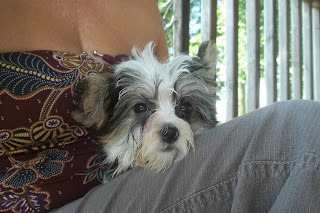 I took the Yorky pups to the vet yesterday for their wellness check. The vet said not only were they absolutely beautiful, but very healthy. Yay! They will be 8 weeks on Monday, July 4 and will be ready for their new homes then. It is a litter of 5 and already 2 of them are spoken for. They have been weened from mom for about 2 weeks and eat great on their own. Give us a call! 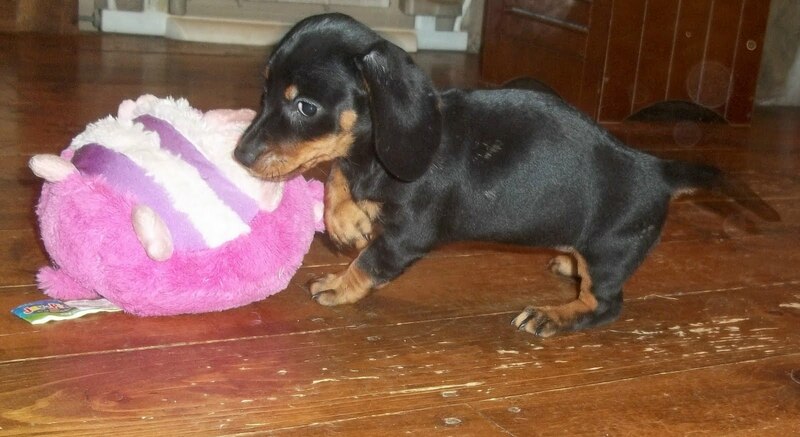 The black and tan female dachshund found her new home this weekend. She has a new friend named Alice. We also got a deposit on one of the male Yorkies. Don't wait too long to come and see them as I am getting quite a few calls. Just 9 pups left at the moment. We have 3 dachshunds priced at $425 each. 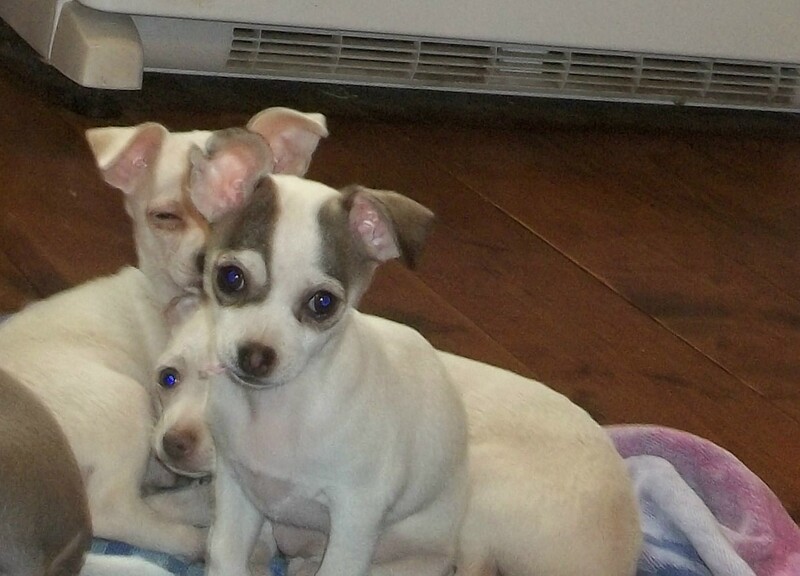 3 Chihuahuas priced at $300 each and 3 Schnoodles priced at $400 each. These pups are ready for their new homes right now! 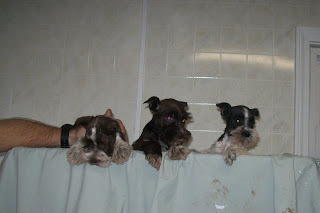 Upcoming are the Yorkshire Terriers which will be ready the weekend of the 4th of July. They are priced at $650 and one is already spoken for. The following weekend, we have a bunch of pups that will be ready for their new homes. I already have a waiting list on some of the upcoming pups, so if you are interested in a particular breed, you should give me a call to get on the list. Getting on the list does not obligate you to take a pup, it just gives you a chance to see the pups before they hit the newspaper ads. We are going to have mini schnauzers, maltipoos, pomeranians, maltese and rat terriers. The pups that will be ready to go the beginning of August are as follows: teddy bears, shih poos, cavachons, schnauzers and morkies. June 22, 2011 What the heck happened to summer? This is the craziest weather! I look outside and the sun is shining, so I go and put all the pups outside to play, by the time I have them all outside, it is starting to drizzle. I gather them all up and put them back inside. By that time the sun has come out again and the pattern continues. The last beagle pup went to his new home today. My sisters neighbor breeds the beagles. His name is Mr. Webb and we love him. He is in his late 70's and the kindest man you could ever meet. He has 2 females and one male. He puts the money he earns in his grandchildrens college fund. His grandchildren are 5 and 7. He claims he won't see them go to college, however, he can be a part of that journey by a financial contribution. Isn't that cool? His other female bred a few weeks ago, so if you know of anyone looking for a pup and can wait until the fall, we should have a litter available at that time. Don't forget, kittens, kittens, kittens. Have 6 babies looking for a new home. FREE, FREE, FREE! Sunday - Happy Fathers Day! to all you dads! If you are looking for a pup today, do not hesitate to call me. I am home, planning on an exciting day of weeding as long as the weather holds out. If the weather gets bad, I guess I will have to resort to housework. One way or another, I would welcome a distraction. Enjoy your day!! We have 3 beautiful dachshund puppies and nobody has called to come see them. I don't understand?? They are playful and very loving sweetie pies. Therefore, I have reduced their price down to $425.00. This is a great price! Give me a call. All 3 of the Teddy Bears went to their great new homes today. I will keep everyone posted as to when the next litter will be available. This is a perfect time to housebreak a puppy, therefore, if you would like to schedule a visit, please give us a call. Don't forget FREE, FREE, FREE Kittens!! Orange Stripes and Black Stripes. Unfortunately, my 3 girls who are sisters were visited by a wandering boy. The result was 3 litters of kittens born within a week of each other. I should have taken pictures as they were raising them. It was amazing, first two of the girls moved their kittens together and would both lay with them and let them nurse together. Then when they were all about 3 weeks old, I went out to the kennel building and they had moved all of the kittens (total of 10) into one big pile. They took turns on nursing shifts. One would lay with them for several hours and then they would rotate. Animals are most incredible. They never cease to amaze me. On to puppy business . . . The reduced cockapoo went to his new home this evening. 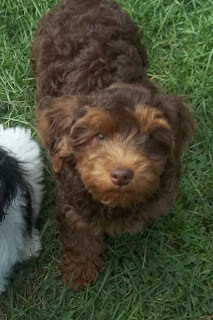 I have added better pics of the schnoodles and dachshunds. 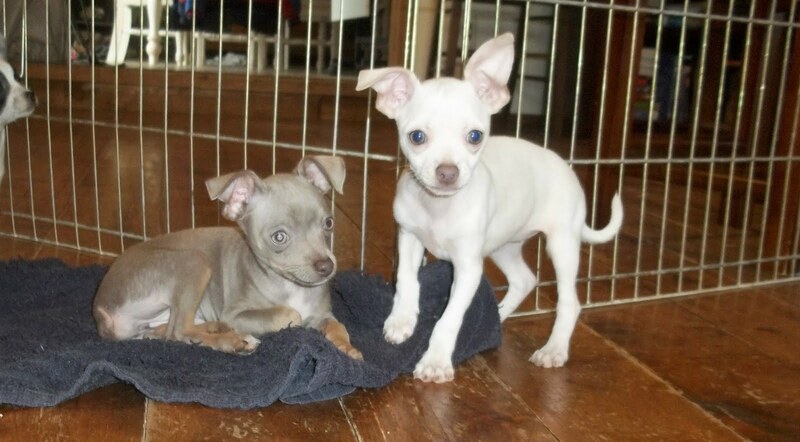 If you are thinking about a chihuahua, the price on these pups is great! These are going to be pretty small adults. Full grown weight should be right around 4#. I have seen prices on pups like these for $1000 and more. I will keep adding new pics as I get them taken. Reduced the prices on a few pups today. One Cockapoo male. He is about 14 weeks old. White and Black in color. Sweetest personality, very loving and cuddly. Just $300.00. 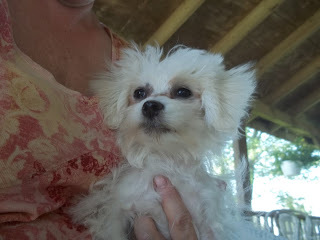 I have also reduced the prices on all the Schnoodles down to $400 each and the Chihuahuas to $350 each. All my prices are very competitive or below market for the most part. Litter of Kittens!!!! Orange Stripes and Blacks. Ready for their new homes right now! Did my best today to get pictures of the pups that will be available to show on Saturday. Not the best pictures ever, but can give you an idea of what they look like. I will try my darndest to snap some better pics over the weekend. But if you are thinking about scheduling an appointment, don't hesitate to call me. I already have quite a few appointments scheduled for Saturday. It seems as if my families dogs all had pups about 8 weeks ago and they are coming to my house/kennel to find their new forever homes. I am able to make appointments for this weekend starting June 4 for any of the new litters that will be available. We can make evening appointmens for any of the pups that are listed on the pages that are available right now. Upcoming litters are cockapoos, teddy bears, pomeranian only child, schnauzers, schnoodles, shih poos and dachshunds. 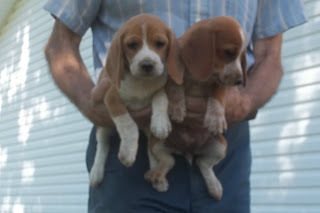 Oh yes and my great uncle had a litter of 4 beautiful beagle pups that I will have this weekend too. I will try to get pics posted of everything on Thursday. If you stop by today. 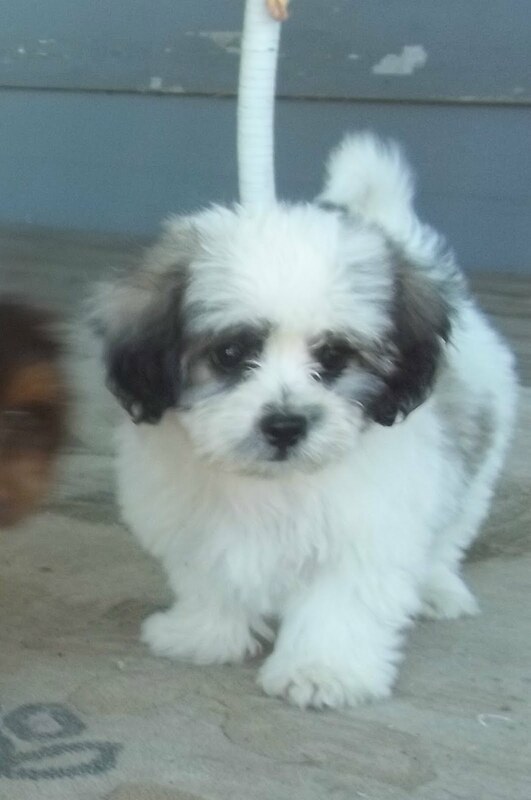 I will let the Maltipoo male go for $250.00 or either of the Morky males go for $300.00. Give me a call, will be available all day. Friday, May 27 - Open all Weekend! Please remember to honor all that are currently serving and have served in the Armed Forces; who dedicate their lives to keeping us safe. We will be working around the house and kennel all weekend, so if you would like to add a pup to your family, feel free to give us a call and schedule a visit. Still have a great selection! I am available till about 2 pm today to take calls and/or show pups. If you don't reach me by telephone this afternoon or evening, please leave a message and I will call you back asap. Please let me know how late I can return your call this evening or early morning Friday. I am making appts. for all day Saturday and most of Sunday. 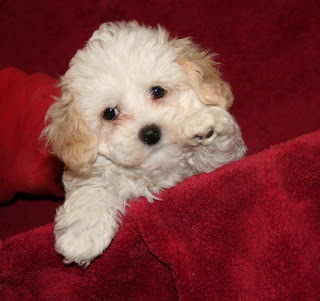 I have reduced the prices of the Morkys and one of the Maltipoos to just $350. Check the links to see what is available. Everything that is posted at this moment is available. I need to make room for the new litters that are going to be ready for their new homes this weekend. Therefore, I am lowering the price on the Maltipoos and Morkies. They are now just $400 each. We will have a few new pups available this weekend. We have a litter of chihuahuas, a litter of shih poos and a litter of Cavapoos available. I will try to get pics posted tomorrow sometime. I do have 3 people on the waiting list for the chihuahuas, so if you are interested in a chihuahua, make sure you give me a call to get on the list. Both of the Yorkie pups went to their new homes this weekend. I know they will have great new homes. I have a new litter of Yorkshire Terrier pups that are just 2 weeks old. Check the link for more info. 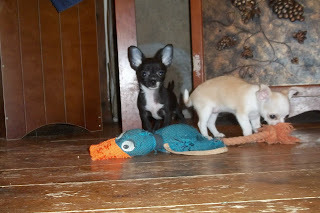 New chihuahua pups are going to be available this coming weekend. Give me a call if you want more info. May 8 - Happy Mothers Day! A couple of pups went to their new homes this weekend. Finally, we are having some great seasonal weather. The pups spent several hours outside enjoying the grass and the sunshing. 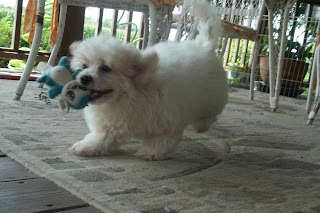 Thanks to Manette and her great family for giving the little girl Morky a new forever home along with their Bichon. I hope that Erin and her boyfriend are enjoying their new little addition too. Pictures are always welcome of the pups in their new homes . . . hint, hint, hint. May 4 - New Pics Posted! Yay! Geek squad worked on the ol' computer. Looks like I will need to invest in a new one soon, but in the meantime, this one is up and running and I could get the adoreable pics posted. The pups had such a good time on Monday running and playing outside. Today, they will be out again. I have outside cats that live in the kennel and pup building, therefore, I think they believe they are dogs. They love to play with the pups as you can see from one of the pics. 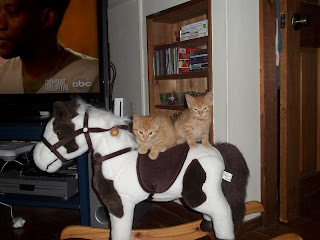 Speaking of cats, we had kittens that will be looking for new homes in about 5-6 weeks. I will be giving them away. If you or anyone you know is possibly looking for a new little kitten, please contact me. They will be very well socialized, as their moms are the cats that think they are dogs and we have picked up and held the kittens since birth. May 1, 2011 - Pups Came Out to Play!!! Such a beautiful day, all the pups got playtime out in the grass today. Anna, my 3 year old granddaughter ran and played and giggled with them. I took great pics, unfortunately, I am on my way to the Geek Squad with my business computer and that is the only computer I can uphold pics on. I sure hope they don't have to keep it too long. As soon as I can I will get those new pics posted on the site. Hope everyone is able to enjoy the sunshine. 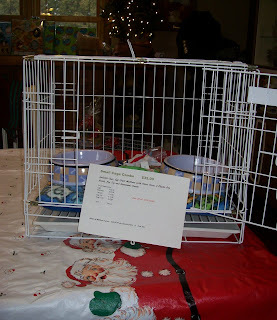 May 1, 2011 - One Chihuahua Pup Found her New Home Today! To avoid confusion, when I post that pups have gone to their new homes, I try my best to take them off of the available pages. 99% of the time I keep the pics updated, so that what you see on the individual pages are what is available at the time. I try to delete those that have found their new homes on a daily basis. That way, there is less chance for you to fall in love with a pic only to find out that it has found its new home. This isn't fool proof, but am doing my best. Thanks Vickie for giving the little girl chihuahua her new forever home today! 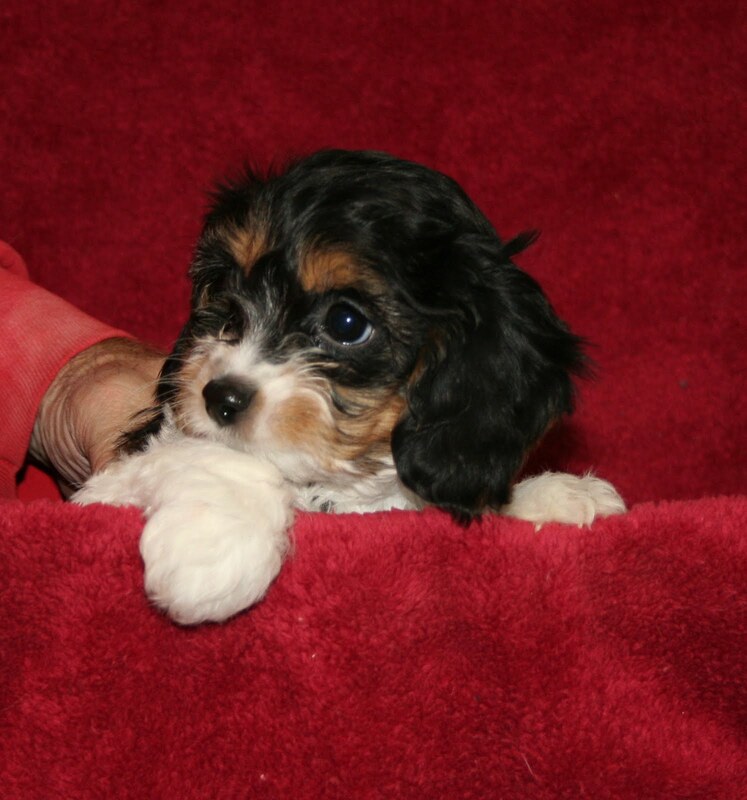 New pics of pups that are available as of today have been posted. I still need to add a few pics. Each pup wasn't cooperating for that perfect Kodak moment today. At least it was nice enough today to get them outside to play a little. Watching them experience grass for the first time was fun. March 2011 - Spring is in the Air!!! Loving this warmer weather and so are the pups! Click on pages to see what is available at this time. We will have a few new litters available after March 28. We have one more little chihuahua. He is a tri-color short hair. We will have a litter of Yorkipoos, Maltipoos, Cockerspaniels and Schnauzers. Whew . . . that is a bunch of pups. Give me a call if you need more info. I will post pics just as soon as I can. Just finished updating site with pictures and descriptions of everything available to date. Upcoming will be a litter of 3 Chorkies, Mom is a Long hair Chihuahua and Dad is a Yorky. They will be in the 4-5# range when full grown. We have 2 males and 1 female. Their price is $500. I will post pictures just as soon as I get them taken. They have begun eating, playing and pretend fighting with each other.